LONDON (AP) -- International donors heeded warnings about the need for increased support for Somalia by pledging more than $300 million Tuesday toward bolstering security, justice and financial institutions in the conflict-scarred east African nation. Somali President Hassan Sheikh Mohamud and British Prime Minister David Cameron co-hosted a one-day conference in London to bolster the beleaguered government in Mogadishu, the capital. Mohamud called the level of support at the conference "very, very encouraging," after stressing that there is a "huge amount" at stake in Somalia and for broader regional security. "We have been given a chance and we will prove in the eyes of the world that we will deliver," he said. "We cannot afford to miss this golden opportunity and we hope the world's support and commitment will be materialized soon." Cameron welcomed pledges made at the conference, saying attendees had taken "major steps" to back Somalia's president and his plans for long-term security and transparent and accountable government. Somalia has endured years of civil war and governing chaos since its dictator was overthrown in 1991. Mohamud was inaugurated in September at the end of an eight-year U.N.-backed transitional government. But from roughly 2006 to 2011, Mogadishu was controlled by Al-Shabab, an al-Qaida affiliate that seeks to overthrow the Mogadishu-based government and install an Islamic one. African Union troops forced al-Shabab out of the capital in 2011 but the group still controls wide swaths of south-central Somalia. Those attending Tuesday — including African heads of state, representatives from the IMF and the World Bank — heard how Somalia plans to develop its security forces, its justice sector and its financial management systems. The U.S. said it would provide an additional $40 million in aid to Somalia, while Britain said it would give 35 million pounds ($54.2 million) to help with security — including 10 million pounds ($15.5 million) over two years to help Somalia extend its armed forces beyond Mogadishu and 1.5 million pounds ($2.3 million) toward protecting Somalia's coastline from piracy. Funds also will help increase the number of police officers and train judges and lawyers. The European Union pledged 44 million euros ($57.6 million) to strengthen Somalia's justice system and police force, and 145 million pounds ($225 million) was pledged by the U.K. to help Somalia cope with future famines. Cameron earlier praised the gains made in Somalia over the past year, saying that extremism is in retreat, piracy attacks are down and the government is moving ahead. "After two decades of bloodshed and some of the worst poverty on earth, hope is alive in Somalia," Cameron said. "Now it is time to fulfill the hope for the people of Somalia. That is what they have been living and waiting for, and we must not let them down." Cameron acknowledged that Somalia still faces huge challenges from poverty, malnourishment and extremism. 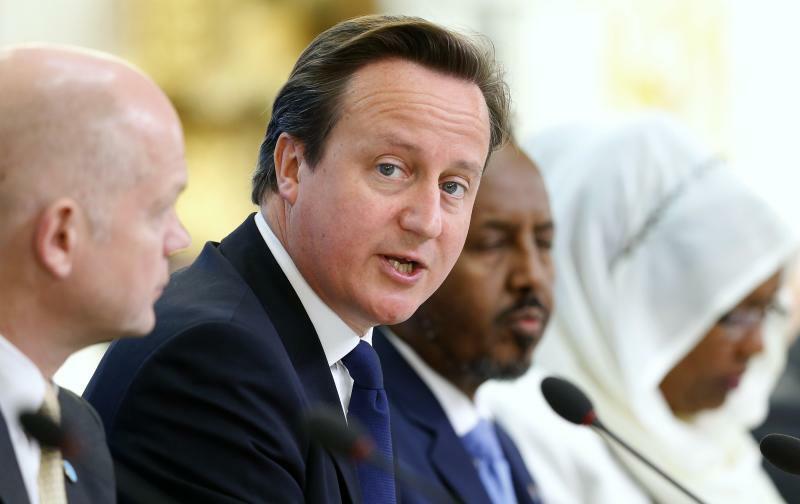 "These challenges are not just issues for Somalia," Cameron told the conference. "When young minds are poisoned by radicalism, and they go on to export terrorism and extremism, the security of the whole world, including people here in Britain, is at stake. " The meeting came under harsh criticism from Al-Shabab, whose leader Mukhtar Abu Zubeyr released an audiotape over the weekend calling the conference a plot to "plunder" Somalia's mineral wealth "under the guise of international trade relations and fighting corruption." He said the international community wanted to discard Islamic law in Somalia and replace it with Western laws and constitutions. Zubeyr also urged his followers to increase suicide attacks to "permanently cripple" Mohamud's government. The next day a suicide car bomb attack in the Somali capital killed at least seven people. Zubeyr blames the area's tensions over land and ethnicity on Britain's colonial-era partitioning of Somalia between Kenya and Ethiopia. Jason Straziuso in Kenya contributed to this report.